If you like history, mystery and suspense, this book is for you! The year is 1952, twelve years have passed since Churchill lost to the appeasers and Britain surrendered to Nazi Germany after Dunkirk. As the long German war against Russia rages on in the east, the British people find themselves under dark authoritarian rule: the press, radio and television are controlled; the streets patrolled by violent auxiliary police and British Jews face ever greater constraints. There are terrible rumours too about what is happening in the basement of the German Embassy at Senate House. Defiance, though, is growing. In Britain, Winston Churchill’s Resistance organization is increasingly a thorn in the government’s side. And in a Birmingham mental hospital an incarcerated scientist, Frank Muncaster, may hold a secret that could change the balance of the world struggle for ever. Civil Servant David Fitzgerald, secretly acting as a spy for the Resistance, is given the mission by them to rescue his old friend Frank and get him out of the country. 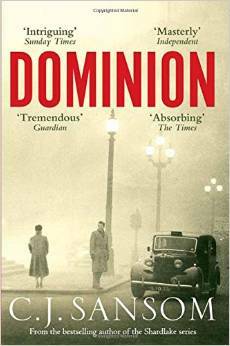 Before long he, together with a disparate group of Resistance activists, will find themselves fugitives in the midst of London’s Great Smog; as David’s wife Sarah finds herself drawn into a world more terrifying than she ever could have imagined. And hard on their heels is Gestapo Sturmbannfuhrer Gunther Hoth, brilliant, implacable hunter of men .